FULL of natural healing oils and butters, so nourishing! 100ml Full of skin nourishing properties, this Mango butter, Cocoa butter and Shea butter trio will nourish and soften your skin like nothing else. Packed with vitamins, minerals and healthy skin necessities to hydrate thirsty or hungry skin. Also great for after sun, salt water and chlorinated water skin care. Especially suited to dry sensitive skin. 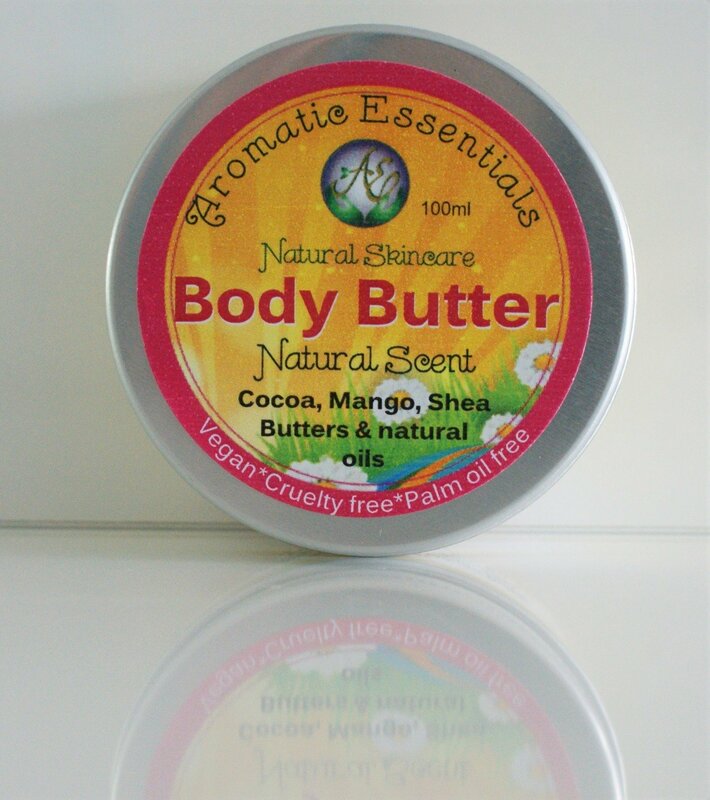 This body butter is amazing after a Sugar or Sea Salt scrub and warm shower. Nourishes any dry skin areas on the body, including feet, elbows and knees. Also doubles as an excellent hair masque or split ends treatment. I love this for all over body moisturising. Absorbs into thirsty skin after a few minutes. Expensive to make, this product goes a long way, so is great value for money! These ingredients are the finest sourced within Australia. Ingredients (in order of amount) - Organic Shea butter, Mango butter, Cocoa butter, Virgin Jojoba oil, Sweet Almond oil, Virgin Coconut oil, Organic Avocado oil, Natural Vit E, Virgin Apricot Kernel oil, Carrot healing oil. These ingredients form the base of all the varieties. With extra natural oils for skin healing and to combat stretch marks and scars. Organic Mandarin Essential oil. Avoid this one during pregnancy as it contains extra Carrot Seed oil which is not recommended. Use at any other time. NO chemicals, NO animal products, No detergents. All NATURAL guaranteed! Disclaimer: The information on aromaticessentials.com.au,facebook.com or promotional material does not replace professional health advice. Aromatic Essentials will not be held liable for any consequences of use of this website, promotional material or products. Please read the essential oils safety data and perform a patch test before using any products to avoid sensitisation or reaction. All statements are, in the best of my knowledge truthful. Understand to use the information provided as educational but not professional medical advice. Aromatic Essentials does not claim to cure any illness or disease by use of any products. Always consult your health professional should you experience symptoms of any allergic reaction.